Mice don't have reputations as being too picky about food, but it's extremely important to be highly discerning regarding their diets. Many foods are, simply put, absolutely inappropriate to feed mice. Love your pet mouse -- and show him that by feeding him properly, 100 percent of the time. Foods that are unhealthy to humans are also an absolute no-no to mice. Never offer a mouse any candies, including chocolate. Processed sugar isn't safe for them. Salty snacks are also inappropriate -- think chips and anything of that ilk. Apart from standard "bad" food, a variety of other human foods are also severely hazardous -- and even poisonous -- to mice. These foods include walnuts, raw beans, rhubarbs, onions, raisins and grapes. Never feed a mouse any of these foods, period. Wheat, lettuce and corn are all also inappropriate for mice, as they can bring on tummy distress and loose stools in the poor little guys. Unless you have veterinarian confirmation that a certain food is OK and safe for your mouse, don't ever give it to him. Safety always comes first. You and the rest of your human family might appreciate the occasional meal at your local Mexican or Indian bistro, but that doesn't mean that your mouse should join the fun. Spicy and hot foods are not appropriate for mice, and should stay far, far away from your little pet's belly, end of story. It's crucial to know exactly what to avoid feeding a mouse, as well as what specifically to feed one. 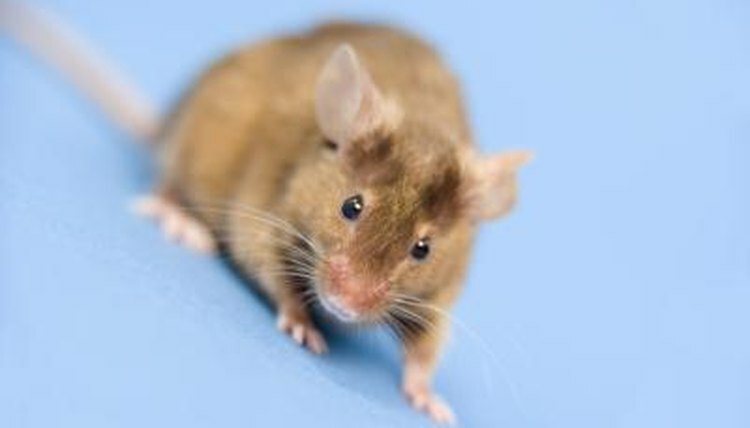 Pet mice generally flourish on diets that center around commercial pellet formulas. Lab blocks also are beneficial for mouse diets. Look for a product that is marked for mouse consumption. If you don't know what to pick, ask a veterinarian for healthy recommendations. As wee snacks, tiny bits of certain fresh produce also can work well in mice diets -- turnip greens, blueberries, celery, bananas, broccoli, apples and peas. If your mouse doesn't quickly eat all traces of his fruits and veggies, promptly clean them out of his cage. Clean water is also imperative at all times.